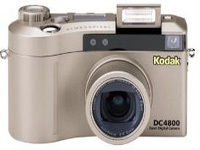 Kodak EasyShare DC4800 Zoom Digital Camera Software Driver and Firmware for Operating Systems. This firmware version improves the following: Auto Focus (AF) in dim lighting situations; Alarms if not in AF range; Landscape/Closeup icon and Exposure; Compensation icon on color LCD screen; PTP (Picture Transfer Protocol). , and filed under Digital Camera and tagged dc4800, easyshare dc4800 software, kodak dc4800 driver, kodak dc4800 firmware, kodak dc4800 software.